This interview is the fifth of nine in a series of Q and A’s with leading changemakers, representing the Millennial generation who are working across sectors to be the force for change on the issues they care about most. From a young age I was naturally attracted to the design, creativity and intentionality in art that the fashion industry embodied. Therefore, it came as no surprise to my parents when I decided to chase my dreams to New York City for internships with high-end designers and magazines throughout college. After these experiences, I ultimately pursued a full-time position at Conde Nast where I further delved into the world of luxury advertising and marketing. During this time, I also started learning more about the “not so glamorous” side of fashion, the side that is often kept hidden behind the beautiful pages of each issue. When I learned that this massive $2.5T industry that I had grown to love was rarely paying its garment workers enough to live on—while also forcing them to work long hours in unsafe working conditions—I became motivated to take action. Shortly thereafter I started working alongside my parents at our family’s foundation, the Cordes Foundation, where we began channeling our combined talents and passions towards making the fashion industry more ethical and sustainable. With my mom’s passion for providing economic opportunities to women and my dad’s passion for equipping the next generation of social entrepreneurs, we were naturally able to integrate my background in fashion to collectively support female-led companies and organizations that were using fashion as a positive force for social change. What problem keeps you up at night? What do you think it will take to solve it? The fact that we, as Americans, dispose around 12.8M tons of textiles annually is just crazy to me! On average that would amount to 80 lbs. per every woman, man and child in the US! Along with being horrible for the environment of course, it’s also a largely untapped market opportunity given that 95% of used textiles can be recycled. Luckily, we are seeing a rise in the circular economy with the emergence of companies like Evrnu, Worn Again, The Renewal Workshop and others who are creating innovative models to recycle clothing. With technology, the barriers to understanding major issues have continued to come down—how do you think that has influenced the way you and others decide to act on major issues like improving ethics in the fashion industry? A major turning point for the industry was the 2013 Rana Plaza collapse that tragically took the lives of 1,100 garment workers in Bangladesh. This was not only a huge wakeup call to brands but also made consumers all over the world start to question the factory conditions in which their clothing was being produced. This formed a global movement called Fashion Revolution which encourages everyone to take action via social media by asking our favorite brands #whomademyclothes. Through asking this simple question, we are calling for greater transparency, accountability and ethics in the fashion industry. Why do you think it’s important to meet young people where they are to use their resources to address social issues, for example, through Impact Investing? Every young person has their own unique set of resources, a personal toolkit if you will, that is built over one’s lifetime. It is by understanding and unleashing the various forms of capital in these toolkits that they are better able to identify how they individually want to address social issues. Whether they want to use their social capital to influence and galvanize people around a specific topic or their intellectual capital to share knowledge and facts about a particular issue or their experiential capital acquired through learning-by-doing, there’s a path for everyone. In the case of impact investing, it’s important to meet young people where they are at given that everyone is at a different stage and comfortability level in their journey. For someone that is brand new, a common first step would be to apply a negative screening on their portfolio to remove companies involved in weapons, gambling, tobacco, etc. For someone that is more advanced, they might go one step further and start seeking out companies that have high ESG (environmental, social, governance) ratings. Beyond the public portfolio, an individual can go even deeper by investing directly in social enterprises that align with their personal mission and values. Deciding where to focus my time! We are constantly hearing about so many amazing initiatives, organizations, conferences and communities—all of which sound incredible—that initially I wanted to be involved in everything. Realizing there are only so many hours in a day, it’s been challenging to scale back certain commitments but ultimately, I feel I’m able to make more of an impact when I can focus on a few core projects rather than trying to do everything at once. What has been your favorite success story? One story that comes top of mind particularly as of recently is that of Kennedy and Jess Odede and their organization SHOFCO (Shining Hope for Communities). We met Kennedy when he was a 2010 Cordes Fellow at the OC (Opportunity Collaboration) and were blown away by his personal story of growing up in the Kibera slum and starting SHOFCO as a teenager with 20 cents and a soccer ball in 2004. It was in 2007 that he was joined by Jess, an American study abroad student at the time, and together they built up the organization and eventually got married. Over the years our team has been proud to support their work and see their impactful programs on the ground in Kibera 3 threetimes. It’s been impressive to watch them grow from a small grassroots organization with one site to an internationally recognized NGO with six sights reaching more than 220,000 Kenyans. The icing on the cake was hearing that just last week they won the $2 million Hilton Humanitarian Prize! Who are some fellow next generation leaders you admire? Sharing a mutual passion for ethical fashion and women’s rights, I’ve come to admire Emma Watson and the leadership role she has taken around these issues. I’m inspired by the way she leverages her platform and influence as a successful actress to advocate for causes that she cares about. She always comes across as thoughtful, articulate and bold when discussing complex topics and ways in which she wants to create change in the world. Another strong female next gen leader that I admire is Gwen Floyd, Co-Founder of the ethical jewelry company Soko. After selling her first company, she combined her background in architecture with her passion for sustainable fashion to create a brand that currently employs a network of 3,000+ artisans in Kenya. Soko has become a close partner of our foundation and it’s been amazing to watch them grow and gain traction with large retailers such as Nordstrom, Reformation and Urban Outfitters. What is one thing you think everyone should know about your generation? We tend to value experiences over possessions. While I can’t speak for my entire generation, I consider myself part of the vast majority that often prefer spending money on meaningful experiences rather than material things. As the rise in the sharing economy skyrockets and we continue to see a shift away from the traditional ownership model, we are beginning to reevaluate what we consider “necessities”. What were once key indicators of security—i.e. homes, cars, offices, etc.—are quickly changing as more and more people become digital nomads and have the ability to bring their work with them while they travel. Our generation is more inclined to choose jobs and opportunities where we know we will learn and grow by experience rather than taking it for salary alone. Personally, I see the importance of traveling and having a diverse set of experiences as it has given me a broader perspective on the world and has positively influenced my professional work. Through study abroad programs, backpacking, international volunteer work, gap years, etc. we gain so much more practical knowledge than a textbook could ever provide. This circles back to the fact that our generation is investing our time, money and talent differently than any before. What’s next for you? What are some of your dreams and goals? Married life! My fiancé and I got engaged earlier this summer so amidst wedding planning, there are lots of new and exciting things in store for 2019. When we eventually have children, my goal would be to raise them in a way where they are continuously exposed to different cultures, languages, people and places so that they grow up learning the importance of diversity, inclusion and global connection. How can people interested in your cause learn more? They can check out our  Cordes Foundation website and follow @cordesfdn on social media to learn more about all of our amazing grantee and investment partners! My personal website and Instagram @sncordes share more ethical fashion tips and pictures from our travels! 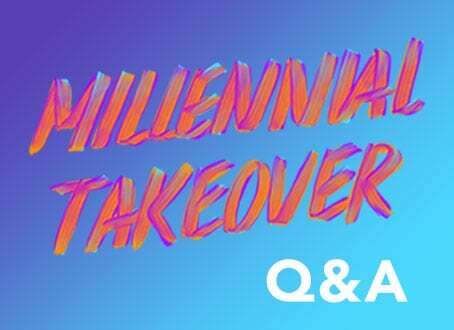 We will be featuring interviews from each of the leaders representing the Millennial generation on key movements and issues today who participated in our recent 10-day Instagram takeover. Stay tuned for the rest of this series and see their stories as part of an infographic detailing ten key traits about how Millennials engage with causes, based on our ten years of research, here. Author, White House alum and Funny or Die Writer, David Litt, shares how he uses humor to encourage civic participation. Michael Smith of My Brother's Keeper Alliance shares how he's building a national movement to help young men of color succeed. Genevieve Ryan, Founder of Real World Playbook, shares how she's simplifying the transition into adulthood for young people.